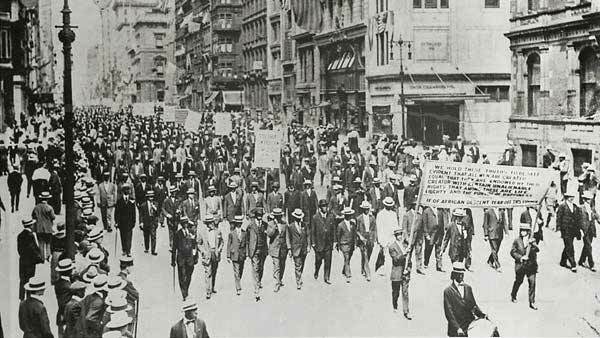 NEW YORK -- On July 28, 1917, the first large-scale African American protest in US history took place on Fifth Avenue. Organized by the National Association for the Advancement of Colored People, the marchers taking part sought to bring awareness to the violence and discrimination blacks faced. Among the events that prompted the march: Rioting in East St. Louis that spring and summer which drove 6,000 African Americans out of their homes, and took the lives of at least forty black Americans. Approximately 8,000 to 10,000 people participated, marching in silence while as many as 20,000 spectators lined the streets to watch. The parade was a success, garnering positive press coverage and support from blacks and whites.